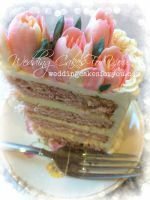 Homemade cakes are the BEST and if you are planning a Do It Yourself wedding then check out the simply gorgeous, made from scratch and love, wedding cakes by my DIY brides. 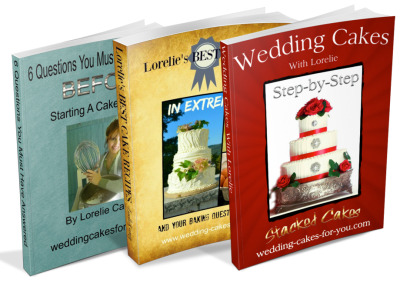 They may just inspire YOU to make your own wedding cake. 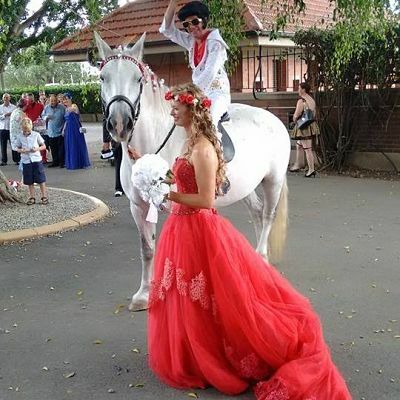 Kylie Crawford is our latest featured DIY bride and WOW what a DIY creation it turned out to be. 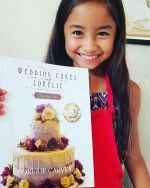 When Kylie joined our support group on Facebook for a little extra help, we all chipped in our best advice and sure enough Kylie's cake was a huge success. 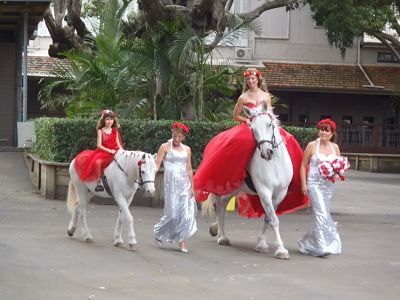 She is what I would call a natural DIY'r and knew exactly what she wanted to create for her wedding theme. As you can see by the colorful photos it was Las Vegas all the way. Even the groom was 100% in character as Elvis!!! 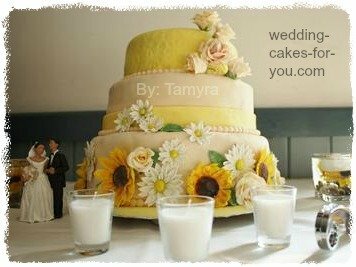 "Thank you so much for your help with my wedding cake. Really appreciate all the pointers. 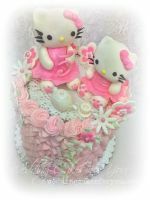 It was so humid and the fondant started to melt and the decorations wouldn't stick. So I rushed to the venue with rollers in my hair and began sticking on decorations in air conditioning. The hairdresser did my hair in 10 minutes and it all turned out great! I am so lucky to have had so much help from the other side of the world." 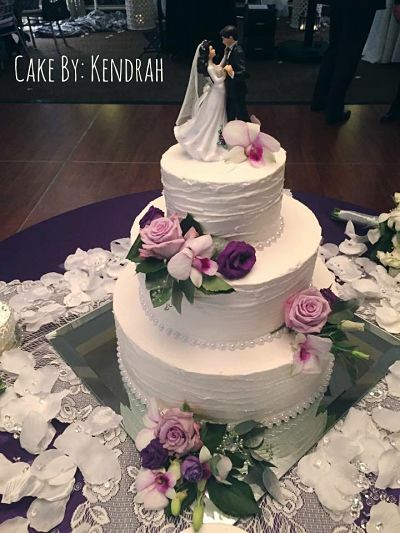 "My DIY wedding cake came out AMAZING! 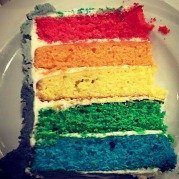 I am dairy free and corn free (among other things) so I did tweak the recipe and use my own frosting recipes, but I ABSOLUTELY COULD NOT have had such a delicious cake without your measurements and guidance! The technique described with the egg whites truly makes a difference in the lightness of the cake. I am so happy with the results!" "Hello! 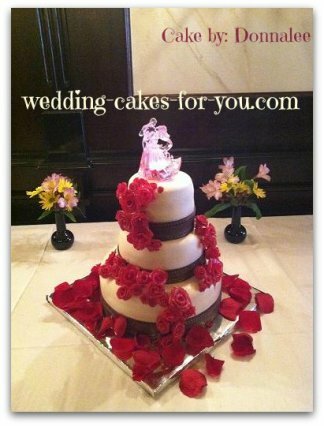 I stumbled upon your website when I was looking up how to make wedding cakes. 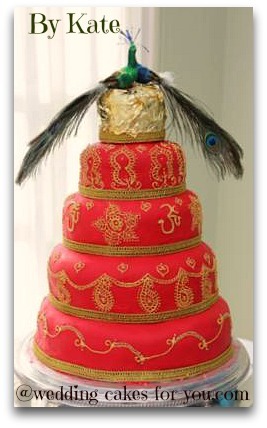 I decided to try and make my own cake when my preferred baker of choice was unavailable for our event. 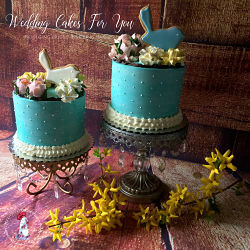 I used the orange cake and white chocolate buttercream recipes from your site and they turned out fabulous! Your site answered all of my questions and was clear and easy to follow. From the freezing to the stacking to the transport. It was all very helpful. Thank you very much! 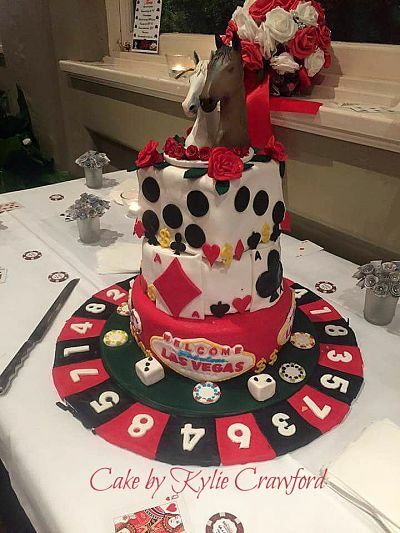 I thought I'd share a couple of pics with you of my cake. Hope you like them!" P.S. 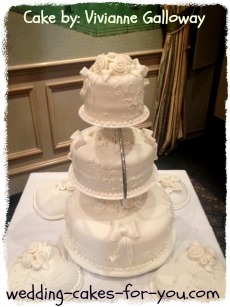 A couple of people said it was the best tasting wedding cake they ever had!! 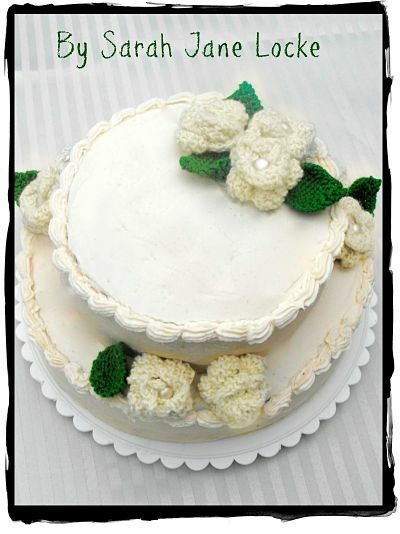 DIY Bride Sarah Jane made a delicious 2 tiered creation using the recipes from this website and her homemade knitted roses. 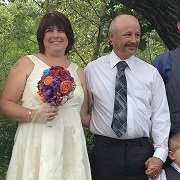 "Our theme of sorts for the wedding a month ago was handmade/homemade. I was really proud that everything was made from scratch for our reception. 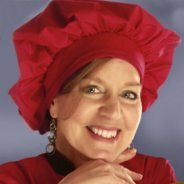 Our extended family also has a lot of food allergies, so I wanted to be in complete control of what was being served so no one would be at risk, plus I normally try to do everything from scratch in our day to day lives. Naturally I baked the cake. I made the layers using the white cake and buttermilk chocolate cake recipes from the WEDDING-CAKES-FOR-YOU website (My new favorite recipes - so delicious!!!!!) and then made 12 cups of buttercream icing. After all the components were ready, it was sent off to a relative to be assembled and decorated as she had really wanted to do that part of the process. I would have loved to have done it myself. 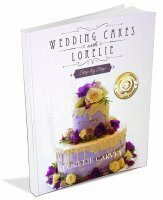 I have so many things I want to try out after finding the Wedding Cakes for You website, our cake tasted heavenly and maybe I'll make a special cake for our anniversary some day that will be 100% me-made." 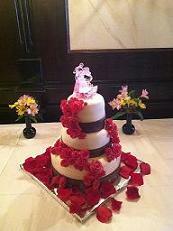 I made my own cream cheese icing recipe and Marshmallow fondant for the covering with fresh red roses. Then I used your recipe for modeling chocolate. THANK you for your website!! 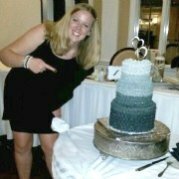 I am so proud of my wedding cake!" 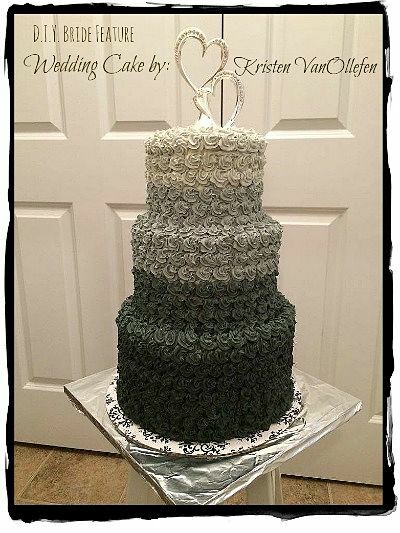 Vivianne Galloway made her AMAZING wedding cake using my NEW ebook. "Thank you so much, it's nice to have a bit of support. Your website is amazing. Kind regards." A few easy ideas for the DIY bride are featured in this sweet video. You will love the earth inspired creativity of the rough hewn wood card holders, the clear glass flower holders with floating candles and pinecones, oranges in a basket nestled in moss, paper lanterns hanging from wire above the outdoor table setting in a field, pumpkins painted with the names of the bride and groom, apples skewered with fresh berries, greens and grasses, and citrus used as a backdrop for guests name tags.